"용기와 인내, 그리고 끈질긴 인내력"
따뜻한 사랑으로 저를 환영해 주셔서 감사드립니다. 오늘 여러분과 함께 손님으로 만나게 되어 영광으로 생각합니다. 대한민국이라는 여러분의 나라에 있게되어 무한한 기쁨을 느낍니다. 대한민국은 어려운 상황에서 잘 극복하는 그리고 정신적으로 강한 나라입니다. (만일 저의 견해가 잘못되었다면 용서해주시길 바랍니다. 저는 외국인이기 때문입니다.) 대한민국의 역사를 공경하는 마음으로 연구하다보니, 대한민국은 분열과 전쟁을 이겨낸 국가며, 이러한 상황에서 통일과 평화를 이룩한 창조적이며 고상한 문화를 형성한 국가입니다. 저가 언급하는 시기는 삼국시대의 역사를 말씀드리면서 유일한 국가로 탄생하는 고려 나아가 대조선국을 말씀드리고 있습니다. 저에게 비친 대한민국은 일치된 국가로 오랜세월을 자치국가로 거의 1,000년동안 지속된 보기드문 국가로 여겨집니다. 문화는 견고하게 발전되어 문명, 문화 그리고 창조적인 예술의 극치에 도달했습니다. 대조선국의 4대 임금이셨던 세종대왕께서 아름다운 알파벳을 발명하셨습니다. 알파벳은 표어문자는 않이었습니다. 극동 아시아에서 알파벳을 사용한 나라가 있습니까? 중국은 어떻습니까? 중국에서도 자국내의 자체 알파벳을 갖고 있지 않습니다. 중국문자는 표어문자를 사용하고 있습니다. 일본은 어떻습니까? 일본에서도 알파벳을 사용하지 못했습니다. 일본도 자체 표어문자로 칸지를 사용하며 이는 중국 표어문자를 기본하여 만들어진 것입니다. 일본은 또한 음절문자인 가나를 사용하고 있습니다. 이는 알파벳이 아니며 20세기에 와서 성문화되었습니다. 캄보디아는 크메르 문자를 갖고있습니다. 이 또한 알파벳이 아닙니다. 크메르 문자는 캄보디아 자체발명품이라기보다는 인디아로부터 기원한 것입니다. 베트남은 어떻합니까? 대한민국처럼 베트남도 중국종속국으로 일본보다는 더 발전된 나라었습니다. 그러나 베트남도 자체 문자를 갖고있지 못했습니다. 베트남은 중국의 문자체제를 20세기까지 받아드리다가 프랑스가 라틴 알파벳을 소개하면서 중단되었습니다. 이처럼 극동 아시아의 어느 나라에서도 알파벳을 사용한 나라가 없으며 오로지 대한민국뿐입니다. 대한민국은 자체 알파벳을 발전시켰습니다. 이는 진정한 음성표기 알파벳입니다. 대한민국이 실제로 창조한 문자입니다. 한글은 정말 아름답습니다. 한글문자로 대한민국 조상들께서는 조선왕실록을 기록했습니다. 조선왕실록은 대한민국의 제151호 국보입니다. 조선왕실록은 UNESCO의 세계기록물에 등재되어있습니다. 조선왕실록은 세계에서 볼수 없는 지속적인 단일왕조로 가장 긴역사를 기록하고 있습니다. 그렇습니다. 세계적으로 유일하게 가장 긴 단일 왕조의 역사기록입니다. 통일된 자체통치로 평화를 추구하는 비공격적인 대한민국은 유일하게 가장 수준높은 창조적인 문화를 발전시켰습니다. 동시에 대한민국은 야만적인 외세로부터 스스로를 보호애햐했습니다. 몽골의 침략도발도 대한민국의 정신을 파괴할 수가 없었습니다. (저의 말씀에 착오가 있다면 죄송합니다.) 제가 외국인이기 때문이라는 것을 이해해 주시길 바랍니다. 몽골시대 동안 잔인한 침략과 지속적이고 치욕적인 예속행위는 거의 125년간 자행되었습니다. 125년은 긴 세월임은 당연합니다. 그러나 대한민국의 위대한 긴 역사에 비추어 보면 그리 긴 세월은 아닙니다. 고려 왕조는 몽골의 침략에서 살아남았습니다. 대조선국은 어려운 역경에서 일어났습니다. 대한민국은 하나의 자체국가로 새롭게 태어났습니다. 평화롭고 고상한 창조적 국가임은 확실합니다. 이러한 상태는 거의 5세기란 긴 세월동안 지속되었습니다. 대한민국의 평화는 20세기에 와서 일본침략의 결과가 있을 때까지 유지되었습니다. 세계 제 2차 대전과 대한민국 전쟁에서 겪은 엄청난 고난을 체험하고 나아가 대한민국의 분단이란 뼈저린 슬픔과 외국의 점령하에서도 대한민국의 정신은 극복과 강인함을 잃지 않았습니다. 남한의 경제성장은 세계적인 현황으로써 모든 전쟁의 파괴 전몰에서부터 신속하게 잘 극복하고 강인한 성장을 실현한 것을 확인할 수가 있습니다. 현저한 사실은 세계 올림픽 경기에서 극복과 창조적인 정신을 우리는 증언할 수가 있습니다. 지난 1988년에 개최한 여름 올림픽 경기와 30년 후에 이루어질 다음 세대의 축제인 2018년 겨울 올림픽경기가 바로 그 정신을 나타내고 있습니다. 대한민국의 영예로운 역사 속에서 정교을 믿고 오늘날 영성생활을 하시는 여러분들을 볼수가 있습니다. 대한민국에서 정교신앙생활을 받아들이고 지켜나감에는 시련과 고난의 시대가 있었습니다. 일본식민지 통치와 대한민국 전쟁의 엄청난 고난을 딛고 정교회에서 그리스도께 충성하며 신앙을 지킨 영웅적인 가정들을 명예롭게 기억하고 있습니다. 국가가 파괴되던 시절 성당 건물도 예외는 아니었습니다. 그러나 이러한 영웅적 가정들이 있었기에 정교회는 지속되었고 조금씩 성장해 나아갔습니다. 정교회를 대한민국에 소개하는 측면에서 볼때, 거대 교회보다는 작은 교회의 모습은 바랍직합니다. (주제넘은 저의 견해인지는 몰라도 하느님께서는 알고계십니다.) 소공동체을 이루는 여러분들은 아마도 더 유익한 점들이 많이 있으리라 믿습니다. 소수지만 강한 공동체이기 때문입니다. 여러분들은 마치 누룩과 같습니다. 소량의 누룩이 빵을 부풀게 하기에 충분하기 때문입니다. 여러분은 마치 소금과 같습니다. 많은 양의 소금이 참맛을 망치는 거와 같습니다. 제가 바라보기에는 너무나 아름답습니다. 저희는 이 사실을 성찬예배에서 현저하게 바라볼수가 있습니다. 정교회가 대한민국 문화에 너무나 아름답게 어울리는 것을 보고 감탄합니다. 성찬예배를 드리면서 더욱 실감합니다. 성찬예배가 집전되는 모습을 보면서 진심으로 아름다움을 보게됩니다. 이를 바라볼때에 저는 너무나 감탄스러워합니다. 이러한 모습을 볼수있는 나 자신이 특권을 누리는 것같아 하느님께 감사드립니다. 제가 오늘 여러분과 함께 대한민국에 있다는 사실에 기뻐하고 있습니다. 저는 다니엘 대신부를 방문하기 위해 대한민국에 왔습니다. 우리는 보스톤에 있는 그리스 정교회 대학과 신학원에서 7년간 함께 공부했습니다. 대한민국에서 온 학생과 칼리포니아에서 온 두 학생이 부모를 떠나 먼 곳까지 와서 보스톤에서 공부하고 있었습니다. 저희는 서로 형제처럼 지냈습니다. 올림피아 사모께서 다니엘 대신부의 졸업식날 보스톤을 방문했을 때에 저의 부모님께서도 켈리포니아에서 올라오셨습니다. 저희는 같은 날에 신학원을 졸업했습니다. 저희 부보님께서 올리피아 사모와 다니엘 대신부의 결혼식을 축하하기 위해 특별파티을 주선해 주셨습니다. 올림피아 사모께서는 칼리포니아에 계신 부모와 누이형제들을 차후에 방문한 적도 있습니다. 저의 친구 다니엘 대신부는 먼 고향을 떠나 왔었습니다. 전화가 유일한 통신방법이었습니다. 그 당시는 인테넷도 없던 시절이었습니다. 대한민국에 전화하는 일은 매우 어려울뿐만 아니라 비싼 통신수단이었습니다. 대한민국에서 그것도 극동 아시아 지역에서 온 유일한 학생으로 지내고 있었습니다. .다니엘 대신부는 많은 친구들도 있었고 저희 학급친구들은 태권도 유단자인 그를 사모했습니다. 많은 친구와 아주 다정하게 학창시절을 보냈음을 확인할 수가 있습니다. 그러나 그는 먼 고향을 떠나와 8년이란 세월을 보내면서 언어와 문화적인 차이점 때문에 고통스러워했습니다. 그러나 그는 참고 견디며 불평을 하지 않았습니다! 친구에서 형제로 서로 가까워지면서 저는 그의 엄청난 인내를 갖고 있음을 확인할 수가 있었습니다. 어느날 그에게 “어떻게 이 어려운 나날을 참을수가 있니?” 물었습니다. 그의 대답은 짧고 심오한 점을 저는 항상 기억하고 있습니다. “대한민국에 계신 우리 교우들을 위해서 참고있네.”라고 그는 대답했습니다. 공경하는 대한민국에 계신 정교회분들을 위해 말입니다. 용기와 인내, 대한민국의 끈질긴 인내력, 뻐와 피속에 살아있는 조상님들의 활기찬 회복력이 역역히 보입니다. 나이가 무르익은 노인의 나이로 서로 만나기 위해 대한민국에 왔습니다. 노인의 입장에서 다니엘 대신부에게 존경과 공경을 표하기 위한 말씀드리고 있습니다. 또한 겸손한 마음 자세로 대한민국에 영예와 공경 그리고 존경하는 마음을 표현하고 싶습니다. 오늘 여러분의 손님으로 이자리에 함께 있을 수있음에 저는 행운아라 생각합니다. 저를 사랑과 따뜻한 환대로 맞아주셔서 대단히 감사합니다. Thank you for receiving me with so much love and warmth. As a guest, I am honoured to be here with you. I am glad to be in your country Korea. Korea is a resilient nation, spiritually strong. (Excuse me, please, if I am wrong in my perspective. I am a foreigner, and perhaps I am in error.) When I look respectfully at Korean history, I can see the nation overcoming divisions and conflicts, arising from them to become united and peaceful, creative and highly cultured. I am referring to Koryŏ, which arose from the Three Kingdoms; and then, following Koryŏ, Chosŏn'gŭl. It appears to me that Korea remained a unified, autonomous nation for a very long period of time, approximately 1,000 years, which is very unusual for any nation. Culture developed steadily, reaching high levels of literacy and literature and creative arts. The beautiful alphabet was invented during the reign of Sejong the Great, the fourth king of Chosŏn'gŭl. An alphabet was invented for the Korean language; not logograms, but an alphabet. Did this happen anywhere else in the Far East? In China? No, this did not happen in China. China does not have its own original native alphabet. Chinese script uses logograms. Japan? No, not in Japan either. Japan has its logograms, known as kanji, which are based on the Chinese logograms. Japan also has syllabic characters, known as kana, which is not an alphabet and which was codified only in the 20th century. Cambodia had its Khmer script, but it is not actually an alphabet either; and it was not entirely the Cambodians’ own creation as it originated from India. Vietnam? Along with Korea, Vietnam had high stature in the Imperial Chinese tributary system, higher than Japan, but Vietnam did not have its own writing system. The Vietnamese used an adaptation of the Chinese writing system until the 20th century when the French introduced the Latin alphabet. So, this did not happen anywhere else in the Far East. It happened only in Korea. The Korean nation developed its own alphabet. It really is a phonetic alphabet. It is actually a creation of the Korean nation. Also, it is very beautiful. In your own alphabet, your ancestors wrote the Annals of the Choson Dynasty. The Annals are the 151st national treasure of Korea. They are listed in UNESCO's Memory of the World registry. The Annals of the Choson Dynasty cover the longest continuous period of any single dynasty in the world: Yes, the longest continual period of any dynasty in the world. Unified, autonomous, and peaceful (non-aggressive), the Korean nation developed a culture uniquely creatively to high levels. At the same time, the Koreans had to protect themselves against barbarians; but not even the Mongol invasions could break the spirit of the Korea nation. (Excuse me if I am wrong. I am a foreigner, a guest.) All in all, the Mongol period – the brutal invasions and the subsequent humiliating vassalage — lasted about 125 years. This was a long time. 125 years are a long period of time, but not too very long within the much greater length of Korean history. Koryŏ survived the Mongols. Chosŏn’gŭl arose in the aftermath. Korea arose anew as an autonomous nation, a peaceful and highly creative nation indeed, for the next centuries, nearly five centuries, a long time; that was until the Japanese colonization and its consequences in the 20th century. Despite this nation’s immense suffering during the Second World War and the Korean War, and then despite the division of Korea and the occupation as a result of those wars, the Korean spirit remains resilient and strong. We may see this resilience and strength in the economy of south Korea, which is a world phenomenon, arising so swiftly from the devastation of those wars. Vividly, we may see this resilience and creativity in the world Olympics: the summer Olympics in the year 1988; and then thirty years later, in a new generation, the winter Olympics in the year 2018. I can see that you here today are carrying Orthodoxy in the honourable history of this nation. 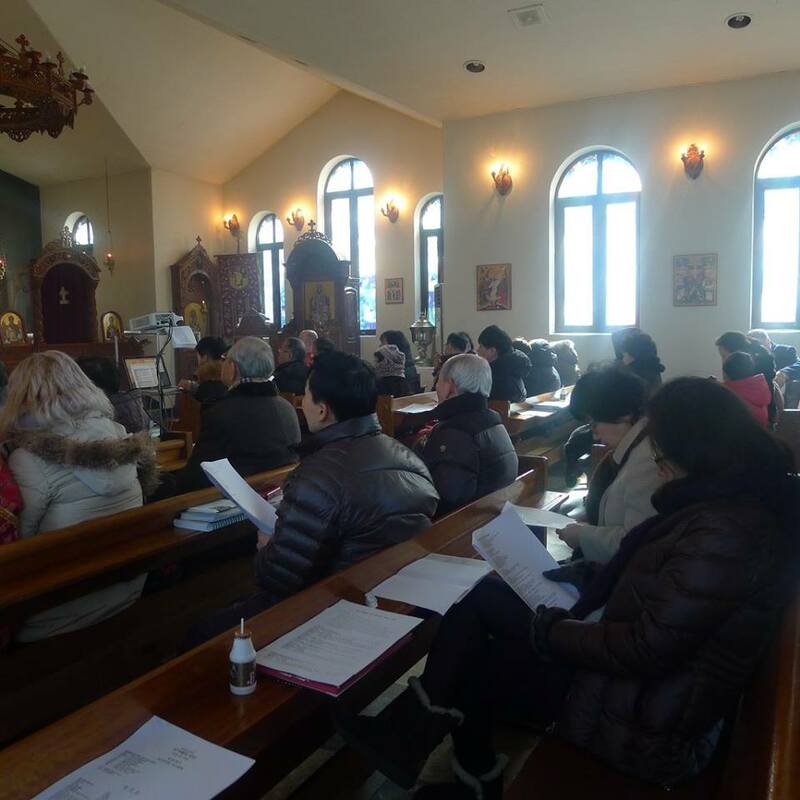 I know that the commitment to Orthodoxy by the faithful in Korea is tried-and-tested. 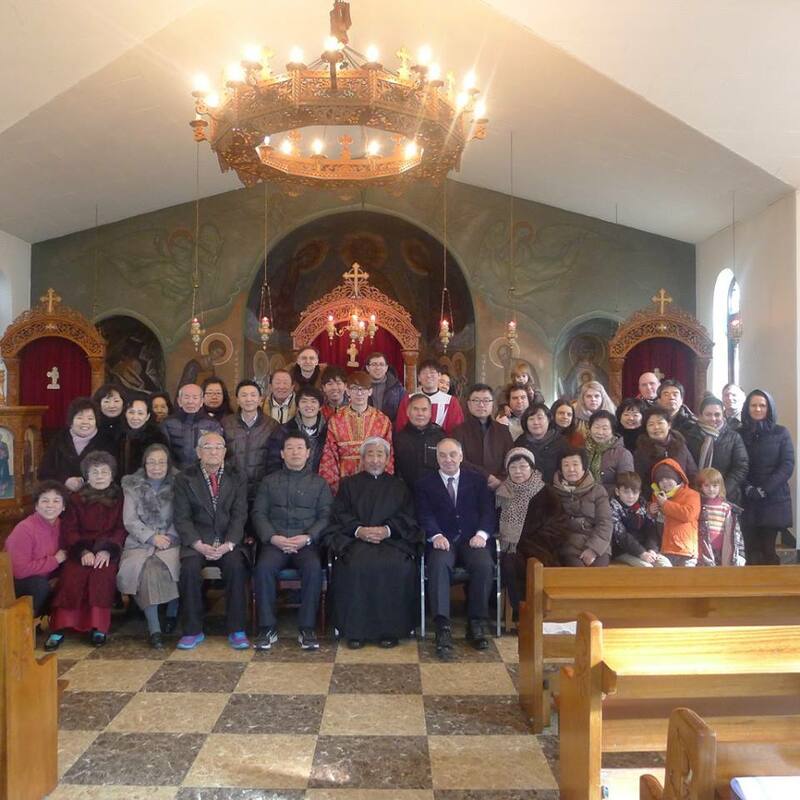 Let me remember with honour the heroism of the families who remained loyal to Christ in Orthodoxy through the immense suffering of the Japanese occupation and devastation of the Korean War. 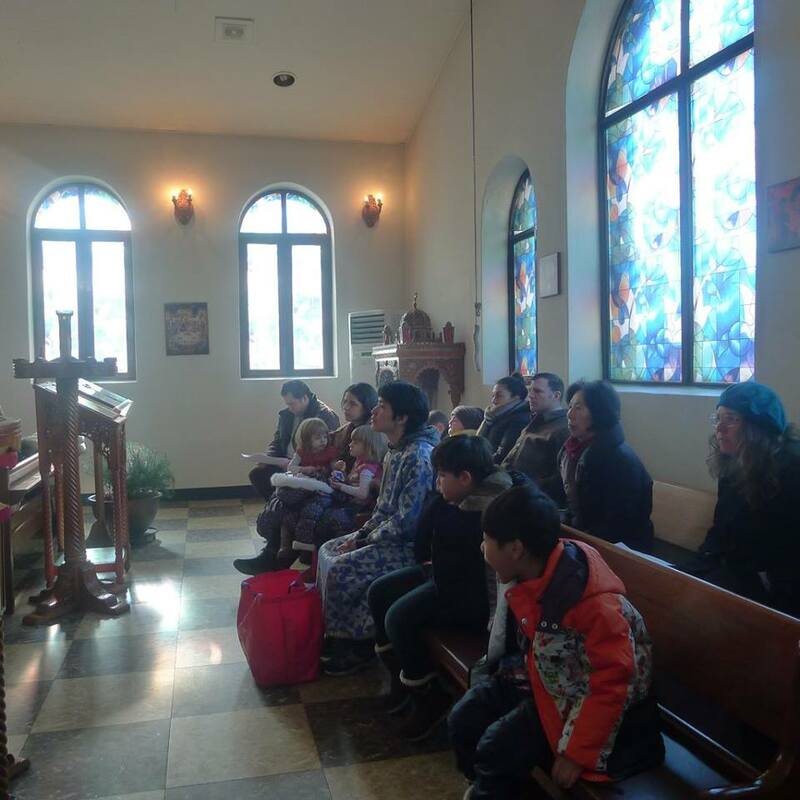 Church buildings were destroyed as the country was ravished; but the faith of these families continued and increased. Carrying Orthodoxy forwards for your nation, you are probably better not to be too numerous. (God knows. I do not know. Forgive me if I am being presumptuous.) It appears to me that perhaps you are better to be fewer as you are. Fewer and strong. You are like yeast. Only a little bit of yeast is needed in the dough to give rise to the loaf. You are like salt. Too much salt ruins the flavour. It is beautiful in my eyes. We may see this most vividly in the Divine Liturgy. The Divine Liturgy is truly beautiful when it is celebrated here. I am fascinated when I see this. I am privileged to see this, thank God. I am very glad to be here in Korea. I am here to visit our respected Protopresbyter Father Daniel Na Chang-Kyu. We studied together for seven years at Hellenic College and the Greek Orthodox School of Theology. He was from Korea. I was from California. We were studying in Boston, a very long distance from our parents. It was too expensive for either of us to go home during the holidays. So, we would spend the Christmas holidays and the Easter holidays together there, he and I. We became like brothers. When Presbytera Olympia came for his graduation, my parent came for mine at the same time – yes, he and I graduated at the same time -- and my parents took Olympia and Daniel out to celebrate their wedding. Presbytera visited my parents and my sisters in California later. My friend Daniel was far away from his homeland. Phone calls were the only mode of communication. We did not have the internet in those days. A phone call to Korea was difficult and expensive. He was the only Korean in the college, the only student from Far East Asia. He had many friends. Our course-mates admired him with his black-belt in TaeKwonDo. He had a good time with so many friends, I am sure. But he was very far away from his homeland for seven or eight long years; and he had to suffer through the differences in language and culture. He never complained. Not once did he complain! But the closer I became to him as friend and a brother over those years, the more I came to see his immense patience. So, I asked him, “How can you do this?” I have always remembered his answer. It was short and profound. “I must do this for my people,” he said. His people: This venerable nation. His courage and patience: The resilience of his nation; the resilience of his ancestors in his blood and in his bones. I am here to visit him these days in our older age now. I offer these words of respect and admiration for him in our older age. Humbly in my older age, I offer these words of admiration and respect for his nation, the honourable nation of Korea. I am fortunate to be here as your guest. Thank you for receiving me with so much love and warmth. 2016년 1월 24일날 개최된 제 32 회기 신도 총회에 참석한 성 바울로 성당 교우들. 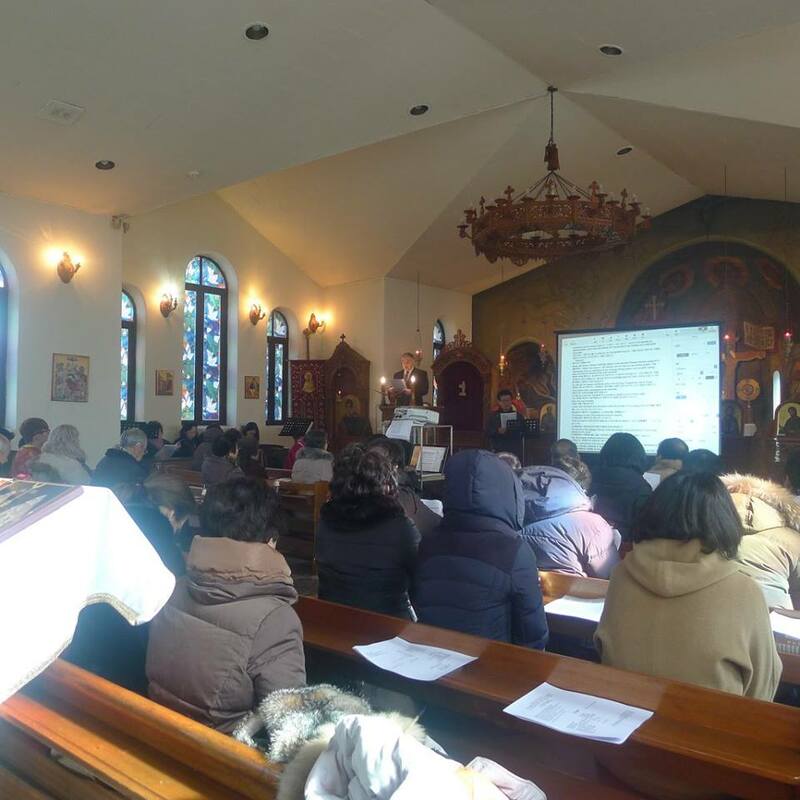 The participants of St. Paul Orthodox Community at the 32nd General Assembly on 24th January 2016.